WELLBORN ARE MY CHILDREN – identical epitaphs on identical tombstones a thousand miles apart – leads photographer Sam Dawson to discover a crime, perhaps the most heinous in U.S. history. More than three-quarters of a century have passed since the undetected mass murders of young women occurred. But the tragedy lives on in this fast-paced journey of discovery. Eugene Eris, the name inscribed on the two tombstones, haunts Sam at every turn. The beautiful geneticist Blair Tennyson helps Sam understand the how and why of genetic manipulation and the dark history of America’s attempt to genetically improve the human species. Sam trusts no one except small-town waitress Annie George. But, like Sam, Annie is linked to Eris. Together they race to unearth the graves of a lost cemetery and to expose the mass murders of people who were involved in an experiment much larger and more sinister than Sam envisioned. Steven W. Horn’s techno-thriller The Pumpkin Eater weaves a story of dark secrets while challenging readers to consider politically charged social issues as the novel races toward an unthinkable ending. The Pumpkin Eater, the nightmarish evildoer of the past, haunts the present and lingers just below the surface of the future. Who is he? What has he done? Who are his protectors? The tension mounts as Sam navigates toward the shocking conclusion. Post Independent on July 18, 2014 The Book Train hosts book signings by two western authors Read more..
Wyoming Business Report – ‎May 31, 2014‎: Wyo. author earns gold for mystery Read more.. 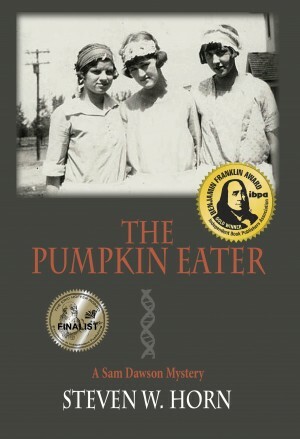 The Pumpkin Eater receives the 2014 Benjamin Franklin Gold Award in Mystery/Suspense Read more.. The Independent Book Publishers Association 2014 Benjamin Franklin Award Program announced that The Pumpkin Eater is an honoree in its mystery/suspense category. Gold award winners will be revealed during a public ceremony in New York City on May 28, 2014. Read more..
2014 Eric Hoffer Award announced that The Pumpkin Eater is a category finalist. Read more..